This past week, I was on staff at a church camp and spent time teaching a Bible Class. Earlier in the Spring, they put out the class list for the teachers to choose a topic, and I guess I got there a little too late…One of the only topics left was on mourning. Yay! Or boo, I guess. As I started preparing for this lesson, I was led to the various “laments” in the Old Testament of the Bible. In these laments, the authors would express their pain and grief in such a way to leave no doubt how they were feeling about things. Typically, the authors would speak in metaphors to describe the pain they were going through, and often the finger was pointed directly at God. Being a former youth pastor, I thought I had taught it all. And having taught “church kids” most of that time, I assumed they have heard it all. As we walked through some of the laments, you could see the students leaning forward in their chairs and paying extra-close attention to the words of the psalmists. They were captured by the metaphors and astonished by the words of those in pain. “Can they say that?” – was a common question as students explored passages like Psalm 88:3-7 and Lamentations 2:1-12. You see, the structure and usage of lament functioned like therapy before there was anything like it. The ancient Jews had a relationship with God that allowed them to both praise and yell at God, depending on what was going on. In other words, the ancient writers assumed something about the human condition: We have to tell the truth, somehow. And, we will end up telling the truth, somehow. Laments are simply a healthy way for someone to mourn and grieve. They are a way to “tell the truth” about how they are feeling without fear of retribution. It’s an opportunity to lay everything on the table and take stock of what you have. Because, the truth will come out at some point – but maybe not in the way we would think. We all are burdened with life and what can happen. Injustice, violence, loss, sorrow, and brokenness dance around us everyday. And with the advent of social media, we know more about human suffering than ever before. We hold all of this stuff inside. The bad stuff of life can become a part of us if we don’t find a healthy way to “get it out”. If we don’t, it comes out in ways that are far less helpful. Anger, abuse, substance, self-harm, depression, anxiety, despair, and violence will “tell the truth” about how we are really feeling about things if we choose not to get things out in a heathy way. Ultimately, we all tell the truth about what is going on inside of us. As someone who loves teenagers, I am worried about their ability to really deal with the hard stuff of life. Many assume venting over social media and texts is the way to go. For a lot of teenagers, there is no real safe place to go and “get it out” unless they go to a counselor or group. Let’s create space and opportunity for our teenagers to lament. 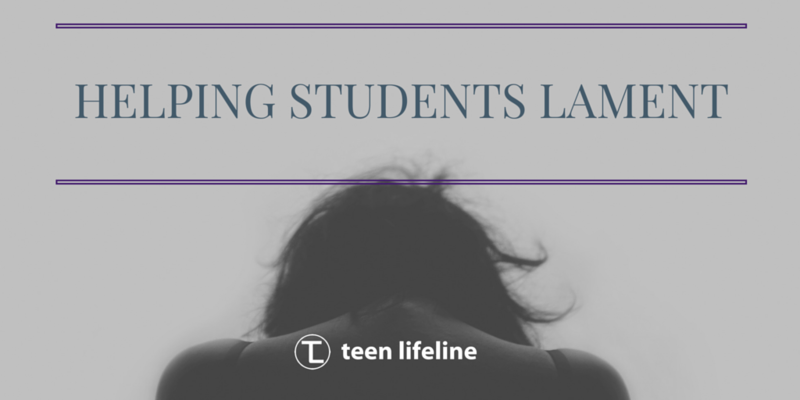 Whether it is at a church, in your home, or within the context of a loving relationship, maybe we can allow a student to speak about how they actually feel regarding the tough stuff of life. It might sound confusing. It might not make sense. They might cuss. They might be disrespectful. They might point the finger at God. Or, you. But, it is how they feel – and that is an incredible starting point for healing. Because, how they feel isn’t where they will end up on their journey through pain. Likely, it is just the starting point. What do you think about this? Have you been around someone who is truly lamenting? Have you? How has it helped? Chris Robey, Teen Lifeline’s Program Director, has worked with teens for over a decade and strives to help students see the best in themselves.